How can I Recover Deleted Videos on Samsung Galaxy S8. Do you have some questions about " Where are videos stored on galaxy s8?" or "How to find deleted videos on Samsung?" Today we will discuss how to retrieve deleted videos on Samsung Galaxy S8. So my dumbass thought that I backed my pictures and videos up on my computer (turns out that I didn't). I realized that some were saved internal and some on a sd card. So I moved them. For some reason, about 140 pictures and 13 videos did not transfer and just save 0mb. Any way to recover these? Thanks. We use our Android devices today in many ways. An example of this is when you travel a lot, you might be using it to capture photos and videos of breathtaking sceneries from places you’ve already been at. However, in the event that all the videos from your Android device suddenly went missing, it can be very frustrating and upsetting. But don’t fret now as we’ve got you covered – continue reading this article for the common solutions in retrieving deleted videos from your Android smartphone or tablet. Part 1: Reasons Why Videos Got Deleted.Part 2: Common Solutions to Recover Deleted Videos from Your Samsung Phones.Video Guide: Step by step guide to Retrieve Deleted Videos from Android.Part 3: How to Recover Deleted Videos from Samsung. Part 1: Reasons Why Videos Got Deleted. It’s either you or someone else has deleted all the videos stored on your Android device. If your gadget is new to you and you’re still not accustomed on how to use it, you might have probably pressed the wrong options from the screen, eventually leading to accidental deletion of video files that you don’t really want to happen in the first place. It’s also possible that someone else might have accidentally deleted them, such as some kids whom you’ve allowed to use your Android device so they can play games in it, but instead of that, they went browsing into the Gallery application. If you have chosen to reset your Android device to its default factory settings, doing such decision won’t just erase all the video files stored on your smartphone, but all the files, applications and data in it. Furthermore, if you’ve pushed through with the reset without any backups, that’s something you shouldn’t do again next time you’ll reset your smartphone or tablet. A recent Android OS update can also be a possible suspect for this issue. Installing updates to your Android device can make it fragile, as when it succeeds. Data might get replaced or lost from your phone, but when it fails, your phone might not run anymore. If you’re using a memory card on your Android device for additional storage, chances are the videos were moved to it from the phone memory. You might wonder how that could happen, but you might have personally moved them due to some reasons like storage concerns. In this case, you might have accidentally included the videos without you knowing it. Part 2: Common Solutions to Recover Deleted Videos from Your Samsung Phones. After knowing the possible reasons why the videos in your Android device got deleted, it’s now time to do some action in retrieving them. The common solutions to resolve such problem covers restoring backups you have recently created that might have the deleted videos. If you believe you have them in one of your backups, proceed in the enumerated methods below; otherwise, skip to Part 3 to use an Android recovery tool to get more options in retrieving them back to your Android device. Every Android smartphone requires its user to have a Google account to use for regular backup, and that same account can be used as well to have access to Google Drive. If you perform regular and automatic backup procedures on your Android device, the deleted videos might have been included in that last backup. You can try restoring them by following the steps from Google Support article. The DropBox application has become one of the default file management programs in the Android OS system. If you’ve chosen this app to store all the backups of your files and data, the deleted videos might have been included in the recent backup you’ve performed to DropBox. You can try recovering them by following these instructions from their support site. If you’ve recently moved a huge amount of files from your phone’s internal storage to its memory card, the videos that appeared to be deleted might have been part of that file movement as well. If this is the case, the videos are all safe in the memory card, only you just need to activate some settings in the Gallery application (or a third-party multimedia application you prefer to use) to also view these files that are now stored on the memory card. Check deleted files if storages to SD card! Another way to check all the files on your phone that are stored from both the phone storage and the memory card, open the application on your Android device where has file management and browsing features (for Samsung Galaxy series, it’s the My Files application). Each file should be organized according to file type – Images, Videos, Audio, Documents, and Download History. Inside the app, there’s a section showing the storages you have on your phone – Device storage and SD card. Select SD card and browse for the video files that went missing from your phone’s internal storage. If you’ve found nothing, you might haven’t move anything to the memory card at all. Don't panic! FoneDog Android Data Recovery can solve your problem in a simple and secure way. This now calls for help from a recovery tool that can give you more options on how to retrieve deleted photos or videos even other kinds of contacts, messages and so on. Video Guide: Step by step guide to Retrieve Deleted Videos from Android. Part 3: How to Recover Deleted Videos from Samsung. If you haven’t included the deleted videos in your recent backup or you just don’t perform any backup procedures at all, using a recovery tool like our Fonedog toolkit can help you out in resolving this problem. 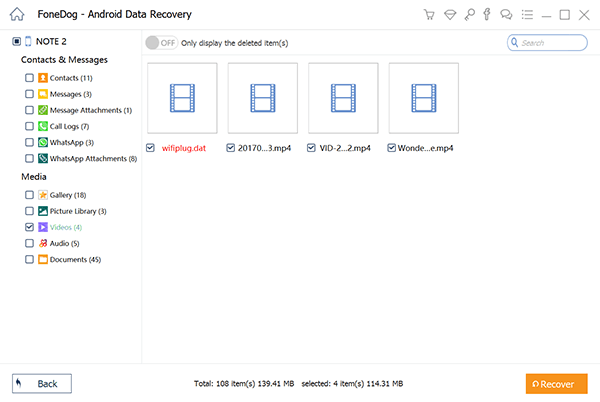 Our Android Data Recovery Developed by FoneDog inventor is a tool with comprehensive and easy-to-follow instructions in recovering deleted or lost files and data from any Android device. The Android Data Recovery is one of the main modules of our Fonedog toolkit, and the other modules it has are used for system recovery, bulk deletion of data, system rooting procedures and data backup and restore that are also applicable to iOS devices. The first thing to do is to download and install our FoneDog toolkit - Android Data Recovery. You can get the installer from this link. After installation, run the program and verify if there are no issues found after it has launched. Step 2: Connect Your Android Device to the Computer. After launching the program, connect your Android device to the computer. Ensure that our FoneDog toolkit will be able to recognize your device. This is an important step to successfully proceed in the data recovery later on. Enabling USB Debugging on your Android device will give our Fonedog toolkit an easy task to read through the phone’s internal storage and find the deleted videos that you want to recover back to your gadget. If not yet in debugging mode, the application will alert you to enable this before proceeding. A) For Android version 2.9 and below, enable it by going to Settings > Applications > Development > USB Debugging. B) For Android version 3.0 to 4.1, enable the feature by navigating to Settings > Developer Options > USB Debugging. C) For Android version 4.2 and higher (including the latest 7.0 called “Nougat”), both the Developer Options and USB Debugging menus are now hidden. To make them accessible, you’ll have to enable first the Developer Options by going to Settings > About phone > Build Number > tap this option 7 times until you see the Developer Options. Click this menu to access its contents inside and see the USB Debugging. 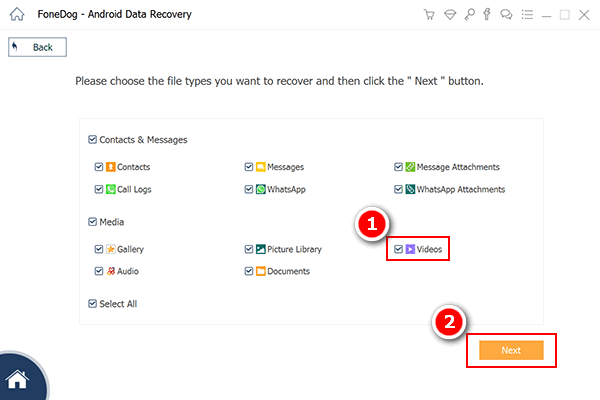 FoneDog not only provides you with the tool to recover deleted or lost data from Android Phone. We also provide you with a powerful tool to get back your data from a broken Android device. Such as Recover data even you cannot enter the password, Fix black screen on Samsung phone, broken screen. Step 3: Proceed to Select the Type of Videos Files to Retrieve. 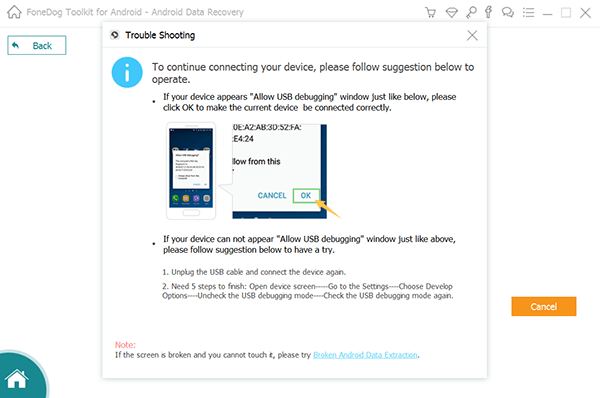 After enabling the USB Debugging feature, the Android Recovery module’s main page will show you the file types that can be recovered from your Android device. Uncheck all options except for the Videos. Click Next to continue. You’ll need to wait a few minutes for this process to get done. Step 4: Preview and Restore Video Files from Samsung Galaxy S8. After the retrieval procedure, our Fonedog toolkit will give you a preview of all the videos that were deleted from your Android device. From here, you can choose which files to restore by selecting them and clicking the Recover button. All the selected files will then be saved to a local folder on your computer. > Recovery > How can I Recover Deleted Videos on Samsung Galaxy S8.